Almost everyone who cares even a little bit about animals likes to imagine what they would do if they had to rescue one. Few of us, however, are ever forced to rise to the occasion. One man was unfortunately put into that situation while out fishing on a lake in New Jersey. Walking to the perfect spot to cast off, he heard a terrible screech coming from nearby.After a quick search, he located the source of the commotion: a terrified baby owl had snagged its wing on a stray fishing line and was unable to free itself. The man immediately sprang into action to rescue the poor creature, though, it’s what happened afterward that was truly amazing.While out fishing on a New Jersey lake, a man heard screeching coming from somewhere close to him. 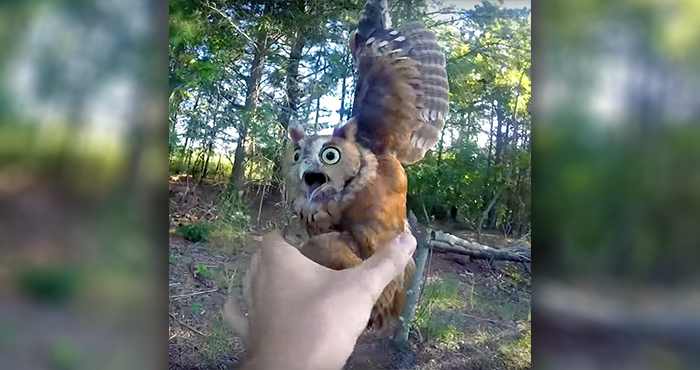 Upon investigating, he discovered a tiny owl that had caught his wing on a strand of stray fishing wire—and he was unable to free himself.